Looking for a way to process your abundance of beans and peas from the harvest season? Invest your time and money in a machine that will take care of the work for you. Instead of hand cranks that get jammed or mash your produce, try an automatic, electric powered machine that runs quickly and efficiently. The Electric Mr Pea Sheller will minimize the tedious labor associated with shelling fresh peas and beans, allowing you to prepare large quantities of meals, or process and can your bounty for long term storage. With a compact design, this device is perfect for restaurant owners and home gardeners alike who are in need of a way to shell large quantities of peas or beans to prepare healthy and tasty meals. The machine takes up roughly the same amount of space as a home coffee machine and is easy to operate. Simply plug in your machine, and place your beans in the slanted aluminum tray when ready to process, and power it on. The peas then slide down the tray, and are worked through the self adjusting rollers which apply just enough pressure to release the pea or bean into the included tray below, while expelling the shell for you to discard. For best results with the Electric Mr Pea Sheller, beans or peas should be firm, green and left out to dry for several hours, or even wrapped overnight in a kitchen cloth or thin towel. 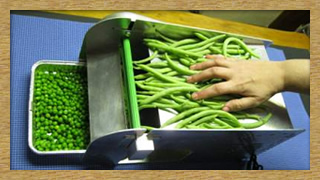 To prevent jamming, and overcrowding with the shelling machine, place your beans or peas in a single layer in the tray. The Electric Mr Pea Sheller contains a number of safety improvements over previous models. The machine comes with an external power switch on the outside casing, allowing you to keep the item plugged in, even while not in use or operating. The motor is fully encased, protecting nearby objects from getting caught in the belt or other moving parts, and includes a small cooling fan to keep it running efficiently and to prevent overheating. Unlike previous models, the rollers of this Electric Mr Pea Sheller are encased with an additional safety shield, which will prevent your fingers from getting caught while the unit is operating.